Hope College men’s golf captains Collin Breit and Evan Telzerow envisioned playing golf in North Carolina long before the season started nine months ago. 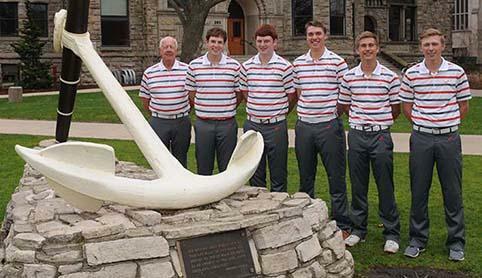 On Tuesday, May 13, the two co-captains will realize their dream when the Flying Dutchmen tee off at the 2014 NCAA Division III Men’s Golf Championships. The 72-hole, four-day tournament will be played at Grandover Resort & Conference Center in Greensboro, N.C. It is Hope’s ninth trip to nationals and sixth since 2006. Coach Bob Ebels’ Flying Dutchmen are aiming to surpass their team-best finish of ninth in 2010. Hope advanced to nationals by winning the Michigan Intercollegiate Athletic Association’s 54-hole Division III qualifier last month. The Flying Dutchmen shot a team score of 919 to win by 15 strokes. They also won the regular-season MIAA championship last fall. Hope has relied on a balanced lineup this season. Freshman Winton Munch of Traverse City, Michigan (Traverse City Central HS), tops the Flying Dutchmen with an 18-hole average of 75.1 over 14 rounds. He was the MIAA’s Most Valuable Golfer last fall. Junior Ben Lewis of Grand Haven, Michigan (Grand Haven HS), is next at 76.4 over 15 rounds. Junior Ben Lanting of Littleton, Colorado (Front Range Christian HS), is third at 76.75. Two golfers averaging 78.1 are Breit and Telzerow of Grand Rapids, Michigan (Forest Hills Northern HS), over 16 and 15 rounds, respectively. Breit and Telzerow are familiar with competing at a national level. They played at the 2012 national championship where the Flying Dutchmen placed 35th out of 41 teams. Breit said he learned from his first trip to nationals that he and his teammates should have confidence in their games while competing with the nation’s best. Centerfielder Autumn Anderson of the Hope College softball team has been chosen NCAA Division III Second Team All-Region By the National Fastpitch Coaches Association. The Flying Dutchmen are in fourth place among 35 teams after the first day of the NCAA Division III Men's Golf Championships.